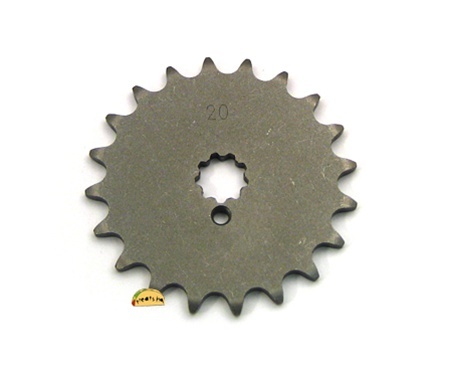 puch 20 tooth front sprocket. specially produced for the people of treatland. you'll have to grind your case a little to get this to fit. or let your chain do the work, if you're dummy. Kittin your za50 and don't wanna grenade your transmission at high rpms? Yuuuuup. This is your guy. Minor case grinding? Yup 2.0, it ain't too bad though. Doesn't take too long. Theoretically you could go up to like 19/40 from the stock 18/40 and maybe you'd be safe in terms of za50 max rpm range but why risk it? 20/40 ( I'm actually at 20/37 But you get the idea ) is much more reasonable in terms of za50 longevity. Additionally, when your gear out your za50 .. you can actually use first gear. It no longer acts as just a starter gear off the line. You can stay in first gear and climb hills with ease .. and if you're really good at tuning, get second gear to shift around 30 so you can actually cruise neighborhoods staying in first gear. Pretty cool. 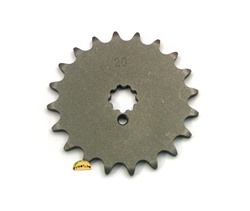 Great quality and fit (with some grinding of the case obviously) I honestly would be scared to take out anymore material for the next sprocket up let alone the 22 tooth. This is the one to get! You can either use a dremel for 20 minutes and make it fit, or you can use a broken rasp for 2 hours if you're retarded like me. Had to add about 6 links to my chain to make it work. 20 minutes with a dremel and it fits. I have a 70cc K-Star, Tecno Estorl and 15mm Bing. With the stock rear sprocket, I still have good torque for climbing hills, but no more popping wheelies. I'll have to GPS the top speed, but it's fast. You can get this to work on an E-50 if you are real-real careful.